Hey! 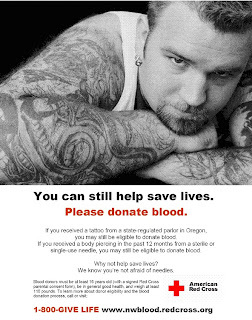 Good news if you have tattoos and live in the state of Illinois – you can now donate blood! The state of Illinois has officially deemed you human enough to donate blood immediately! Previously, Illinois state law prohibited anyone with tattoos or piercings from donating blood for a period of at least 12 months following a piercing or tattoo. In all seriousness though, it wasn’t so much that the state of Illinois previously had a problem with tattooed people, but more a case of the state of Illinois not being sufficiently prepared to regulate the tattoo industry. Now however, Illinois has a Body Art Division amongst the Department of Public Health. This Body Art Division is responsible for enforcing and inspecting the tattoo studios and shops of Illinois, ensuring that people who go to get tattoo work or piercing done do so in a clean, safe and hygienic environment. Since this body is now in place, Illinois was confidently able to pass its Tattoo and Body Piercing Establishment law which makes tattooed and body pierced people’s blood just as valuable as anyone else’s – without the 12 month wait. This law should have been in place years ago, but…better late than never.